St Vincent and the Grenadines (“SVG”) is a close group of islands within the West Indies. 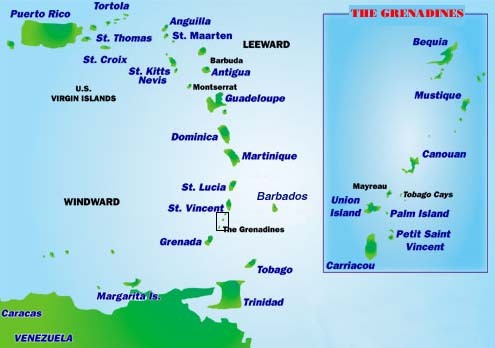 The major islands from south to north include Union Island, Petit St Vincent, Palm Island, Mayreau, Tobago Cays, Canouan, Mustique, Bequia, and St Vincent. Of course there are a number of smaller islands dotted throughout. 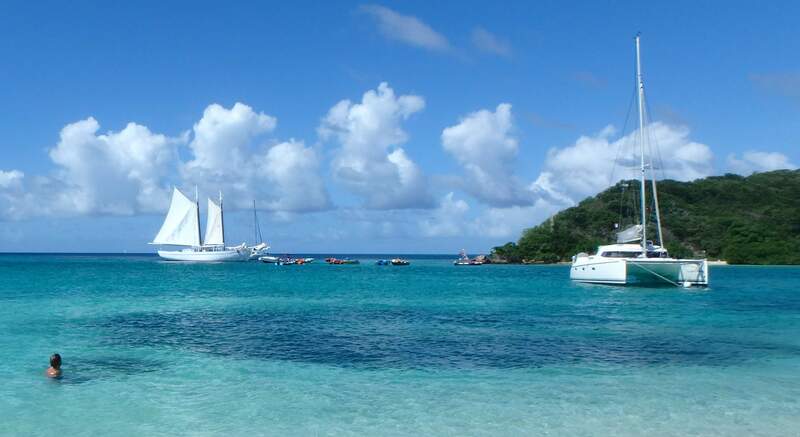 One of the attractions of this chain of islands is the ability to sail between islands within a day; the top of St Vincent to the southern end of the Grenadines is only around 50nm with many fine anchorages along the way. Our entry into SVG was on the east coast of Union Island at the touristy port town of Clifton. Union Island is a mere 9nm north of Carriacou, where we officially checked out of Grenada at the Tyrrell Bay Customs and Immigration office. Clearing into SVG at Union Island is straightforward. Both Customs and Immigration are located at the airport, a short five-minute walk to the north of town. After completing the obligatory arrival form, paying EC$35 per person and having our passports stamped, we were cleared in for one month. Heavy rain the day before kept this watering hole quite wet! Walking back into town leaving our dinghy at the Anchorage Yacht Club dock, I withdraw Eastern Carribbean Dollars from the local bank, then bought some veggies and fruit from the town market, fresh bread and coconut cake from the bakery, plus some frozen chicken and pork from one of many supermarkets. It’s very touristy here and there’s plenty of eateries plus souvenir stores selling t-shirts, sarongs and other trinkets for tourists to spend their money on. Clifton Harbour is protected by coral reef. Navigable water encircles Roundabout Reef located in the middle of the Harbour, and much of the area taken up with moorings, which the local boat boys will help you with if needed. But for those like us that prefer to anchor, there’s room outside the moorings for dropping the hook. Despite the 20knot winds that blew steadily from the north-east, the anchorage was fairly well protected from bouncy seas. 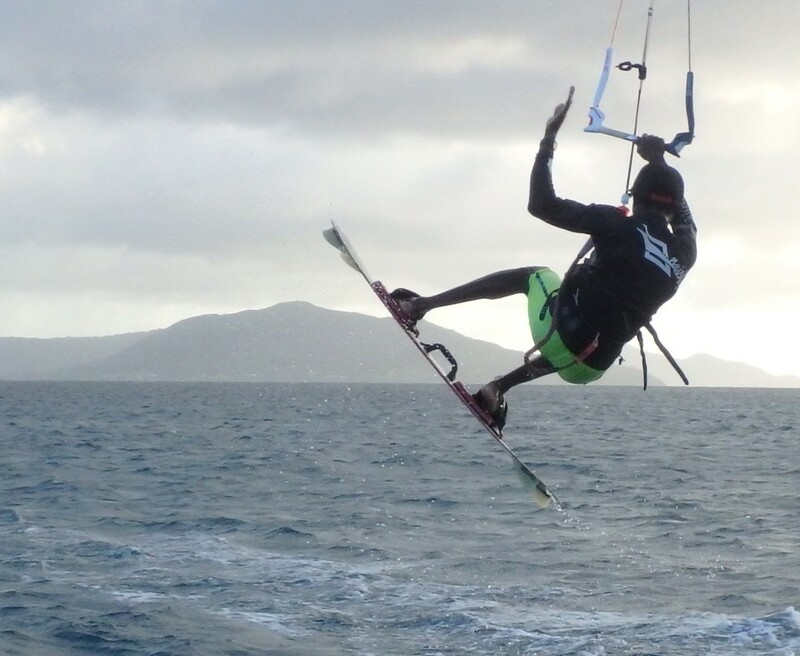 Taking advantage of the breezy conditions were a number of kite-surfers. Obviously they knew how to fly the kite otherwise we may have had a few of them snagged in our rigging. One guy with a big white grin came awfully close to us, riding his board high above our bow, even closer when he knew I was photographing him! After a breezy night on anchor at Clifton tucked behind the reef, we had a lovely, albeit short, sail north to the Tobago Cays. Anchored in 5m between the small islets of Petit Ramea and Petit Bateau we dinghied through the cut to Baradal Island and the popular turtle conservation zone. I have to say although the Tobago Cays is extremely photogenic, underwater is a little underwhelming; I saw a few fish, one turtle and a crumbling white reef resembling an underwater moonscape. We didn’t scuba dive outside the outer reef so I can’t comment on the quality of diving there. SVG is a playground for charter yachts and apparently we are fortunate to arrive just before high season when the number of yachts increase tenfold. 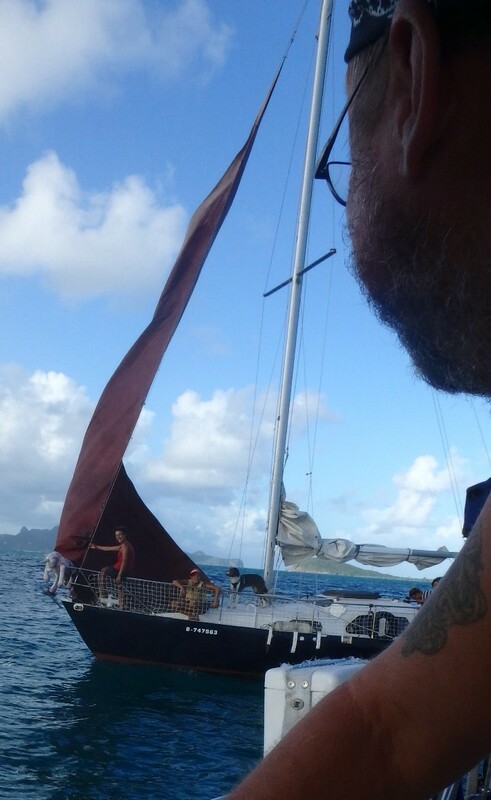 At Tobago Cays we anchored with around ten boats, but boat boy ‘Sydney’ (actually he’s older than us!) told us that in peak season (Jan-Mar), there can be hundreds of yachts here. Glad we came now! Now here’s an amusing situation. After returning to our boat after snorkeling, a couple of small dilapidated yachts sailed into the bay, weaving their way between the charter catamarans. One, with a crew of French blokes, had a rust-stained hull, decaying sails and frayed cloth sheet blowing in the wind from the stern. The other, with its black hull, nasty topsides and rust colored foresail, had a one meter high stuffed fluffy pink unicorn strapped to the bow! This vessel’s crew was a dog, plus five scantily clad French women! Before we knew it, the bare-breasted young women dropped their anchor right on top of ours. Their transom was only metres from our bow! In French and broken English they innocently explained they had no engine therefore no choice but to anchor there, all the while smiling cutely and shrugging shoulders revealing carefree armpit hair. Wayne was up at the bow in a flash! I’ve never seen him so pleased to have another yacht anchor on top of ours! As luck would have it, my Olympus Tough camera died only one hour before otherwise I’d have some ripper photos! (Relying on my iPhone now for pics). The next morning we waved away the fully dressed French crew and dog. We had re-anchored ahead of them the previous day as the thought of a boat with no engine ahead of us in 20+ knot winds didn’t make us feel comfortable. They were all smiles even as they manually pulled their anchor up the rusty bow roller, the pink unicorn perched atop. Obviously you don’t have to be wealthy to visit Tobago Cays – just a vessel that floats and a desire to see the world. Soon after we raised anchor and had another short but very enjoyable sail around the north of Mayreau then south to Chatham Bay on Union Island’s west coast. Here we dropped anchor on a patch of hard sand visible from the short seagrass at the northwest corner of the bay. From here we could easily snorkel to the point, although the water wasn’t as clear as Tobago Cays which meant free diving down to get a closer look at the corals and fish. Taking the dinghy to the beach we strolled along the sand to the resort, then strolled back to the Sunset Beach Bar for a cool drink. This is a great anchorage, very flat, although we are told that the wind can gust at times. These punters’ outboard broke down. Ally to the rescue! From Chatham Bay we sailed to Admiralty Bay, Bequia on a 25deg heading. Despite a sailing distance of a mere 28nm, the wind, despite being light at around 7-9kn, was at 60deg, which meant we had to sail close reach and tack a few times to stay close to our rhumb line. We spent the whole day sailing and had to motor the last three miles directly head to wind to reach the anchorage by late afternoon. Bequia (pronounced Beck-way) is mentioned n the tourist guide as “the perfect Caribbean island”. I have to say, although I think Tobago is great, Bequia is certainly an attractive island. Port Elizabeth, the main town, despite it being touristy, is extremely pretty and easy for provisioning. Admiralty Bay is filled with moorings but we anchored near Princess Margaret Beach to the south of the bay. The water is very clear despite the number of boats in the bay and the beach is only a short swim away. There are loads of eateries along the Belmont Walk; a convenient concrete path that follows the water’s edge. Beautiful homes perched on the small hills overlook the bay with simply stunning views. For yachties, there are some good supermarkets in town. I’ve been stocking up from Knights Trading on the side road near to the yellow Customs building, complimented with veggies from the market. To make life easier for some, Miranda’s Laundry will boat out to your vessel and pick up your laundry and bring it back that day for a reasonable fee. Daffodils also has full service of laundry, ice, fuel, etc. There’s also a guy that sells bread from his boat each morning, while on weekend the Bequia youth zip around selling ice to anyone that wants it. The people here are friendly and relaxed. A cruise ship arrived at Bequia anchoring well offshore as the port isn’t big enough for a ship that size. A couple of smaller boats ferried hundreds of cruisers to a small dinghy dock right in town where cool drinks and friendly folk were available for the paid-up tourists. Roads shrouded by a canopy of rainforest and breadfruit trees keeps walking arelatively cool experience, but taxis are available too. The walk to Friendship Bay takes about an hour return; while a steep walk up the hill to Mount Pleasant for views of neighbouring and private Mustique Island takes around the same time. A walk to Fort Hamilton on the northern side of the bay takes around 20 minutes with great views of the bay in the afternoon. While I was out walking taxi-loads of cruise-ship passengers were transported to all the tourist hotspots fitting in as much as possible in the few hours they have ashore. I can’t imagine they get to sample the pace of life of these islands with a crazy schedule like that! 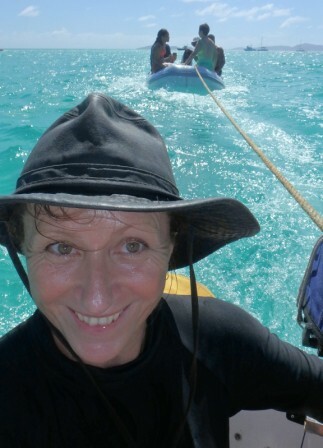 The trade winds are blowing strongly lately with 20-25knot winds testing everyone’s anchor on the dead coral seabed. There must be over 100 boats of various sizes, shapes and value in Admiralty Bay, all of us enjoying the clear water and meeting friendly locals. Many of the vessels are charter boats which tend to leave each morning, only to be replaced by more charter boats each evening. 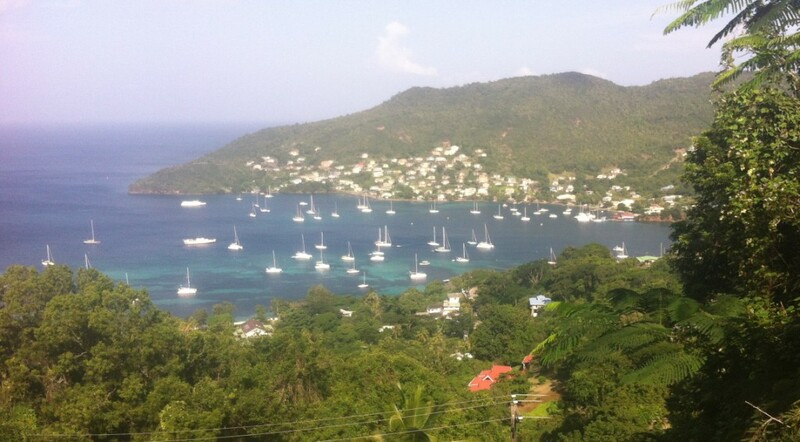 Until the winds ease a little, we are happy enough to hang out in lovely Bequia before making a run north. Two weeks in this paradise is a pleasure most tourists can only dream about. To us, it’s easy to dismiss it as ‘just another island’, but Bequia is a special island within the Grenadines. In fact, I think Bequia has bumped Tobago as my number one favourite island in the Caribbean! Aside | This entry was posted in 2016, SVG and tagged Bequia, Caribbean, Chatham Bay, SVG, Tobago Cays, Union Island. Bookmark the permalink.